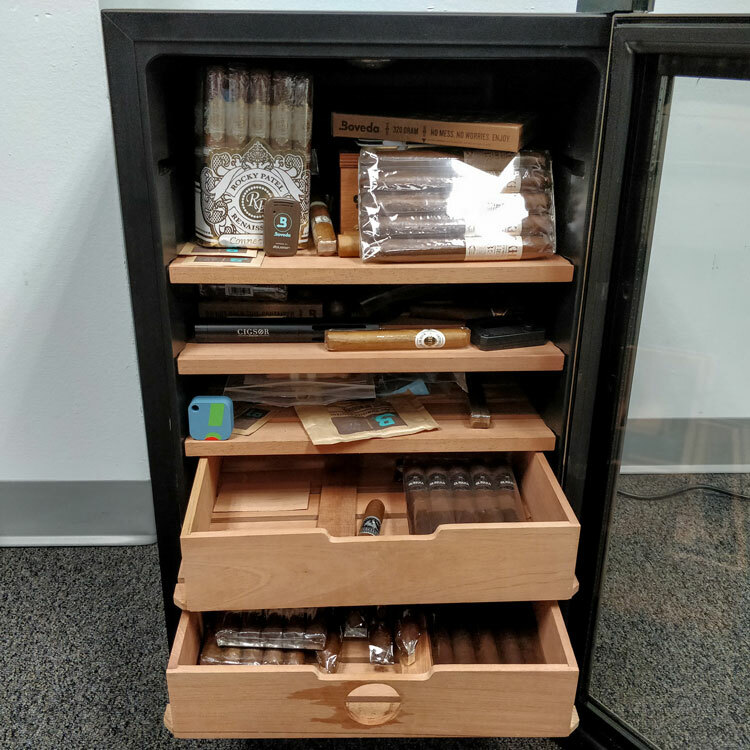 Not to be confused with wineadors, a cigar cooler is a premade storage system for your stogies. Offering in-built temperature control, it’s a very attractive option for people who live in particular hot and arid climates. Given that cigar coolers are a relatively new concept and something of a minefield, we’ve created this guide that explores their benefits and drawbacks. You’ll also learn about the best cigar coolers on the market. Why Buy A Cigar Cooler? You can use the links above to jump ahead. You can also head to the menu below to see the best coolers as well as other guides that we cover. What Are The Best Cigar Coolers? As mentioned in the introduction, cigar coolers offer in-built temperature control. This feature is particularly beneficial for those living in hot climates as cigars tend not to fare well in high temperatures. Similarly, environments with temperatures that tend to drop or spike may want to use a cigar cooler to ensure consistency. After all, changes in temperature also have a molecular effect on humidity. If the temperature near you keeps jump up and down, it may prevent the humidity from remaining consistent in a normal humidor. However, even if you live somewhere with a relatively mild climate, you may want a cigar cooler just to ensure consistent and safe cigar storage. Since cigars are already an investment, there’s no harm in trying to provide them more protection. Although it has already been said several times, the temperature control is the largest benefit of a cigar cooler. Most types of storage including wooden humidors tend not to offer much insulation whatsoever. Therefore, it can be quite difficult to ensure a consistent temperature of around 70°F (21°C). Furthermore, some people prefer to keep cigars that they intend to age at lower temperatures. Given that cigar coolers offer a wide range of temperature control, you’ll be able to obtain this too. 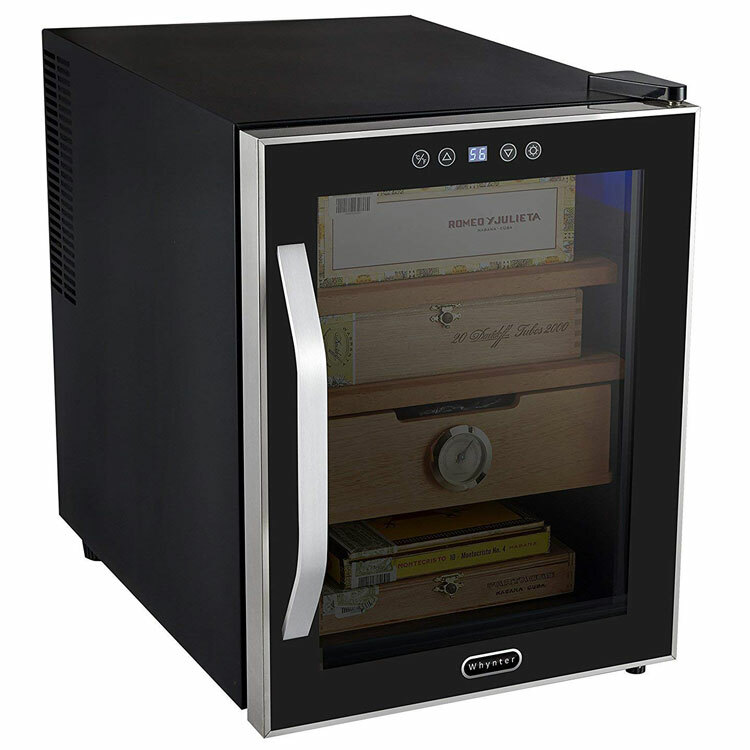 Unlike the majority of glass humidors and cabinets, cigar coolers are also designed to be airtight much like typical refrigerators. Therefore, they also offer an interesting option if you want to be able to safely admire your collection. Finally, wineadors used to be the main choice for those who sought temperature control. These were essentially wine coolers that had been converted for cigar storage. However, they weren’t without their quirks and tended to cause humidity issues. 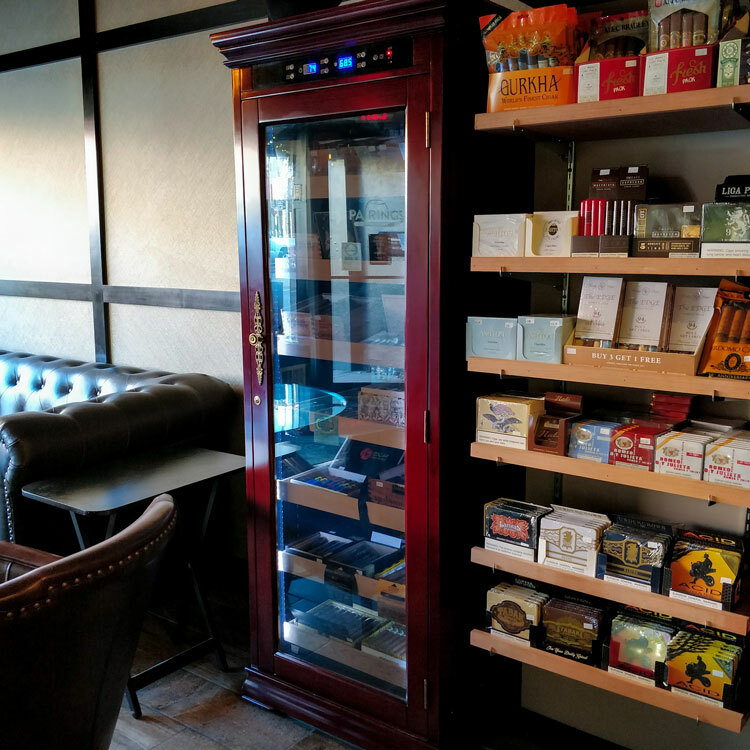 Furthermore, since cigar coolers are designed just for cigars, they are also equipped with Spanish cedar shelving, which has its own benefits. Unfortunately, cigar coolers aren’t a perfect storage solution for your precious sticks. While they’re often designed with the latest temperature control technology, they may have their own issues. One of the greatest problems issues usually derives from the electronic components. Sometimes, they’re poorly made and the temperature control can be either inconsistent or unreliable. If this is the case, it may cause more harm than good as your cigars are exposed to potentially worse temperature changes than if they were in a regular humidor. Other issues may come from the glass front. As cigars are quite sensitive to light, it may be counterproductive to make them so visible. As such, you’ll need to plan carefully where you place your cooler. For instance, installing it near a window that catches the sun would could risk exposure to excessive UV light. Another common issue is humidification itself. Given that these are electronically-powered devices, it’s easy to assume that they also offer humidity control. Unfortunately, this is rarely the case and a lot of people underestimate the degree of humidification that coolers actually require. Additionally, remember that cigar coolers are dependent on electricity unlike other humidor types. Therefore, they may lose their usefulness in the event of a power cut. Finally, cigar coolers are something of an investment. Not only is the initial price often higher than premium wooden humidors but the running costs are not to be ignored. After all, you’ll be owning another (albeit smaller) refrigerator. Aside from the points listed above, however, cigar coolers tend to be a relatively safe bet for cigar storage. Overall, buying a cigar cooler can be a challenging experience. Not only is the investment quite large, but there are a lot of options on the market. This section of the guide will give you a few pointers. Firstly, ensure that the cooler features Spanish Cedar shelving. This is often the norm for coolers yet it’s always worth checking beforehand. A cigar cooler with Spanish cedar shelving is rarely worth the investment. There are lots of cheap cigar coolers on the market. Be sure that you’re purchasing one with positive reviews either online or from your entourage. It’s always worth researching to see whether the one you want has all the features that you need. Strangely enough, the majority of cigar coolers come only equipped with an analogue hygrometer built into the central shelf. Even after calibration, these are notoriously inaccurate. Therefore, be sure to buy a digital one so you can periodically and accurately check the RH level inside your cooler. Another benefit is that they often come with an in-built thermometer that will give you a second opinion on the temperature. As mentioned above, cigar coolers can be a bit fiddly when it comes to humidification. Most of the time, this is caused by overlooking to season them or underestimating the humidification that they require. Since you’re working with an airtight seal, you should always opt for a humidifier that offers two-way humidity control. Most humidifiers only provide one-way humidity control, which means that they continuously diffuse moisture. The problem with this is that even when you’ve reached the right RH level, they will continue to increase the humidity. Meanwhile, two-way humidity control absorbs excess moisture and prevents it from being too high. Similarly, make sure that your humidifiers are adapted to the size and capacity of the cooler. Most coolers are quite large and will need more than your typical humidor. For the reasons listed above, we recommend Boveda’s 320g humidity packs. 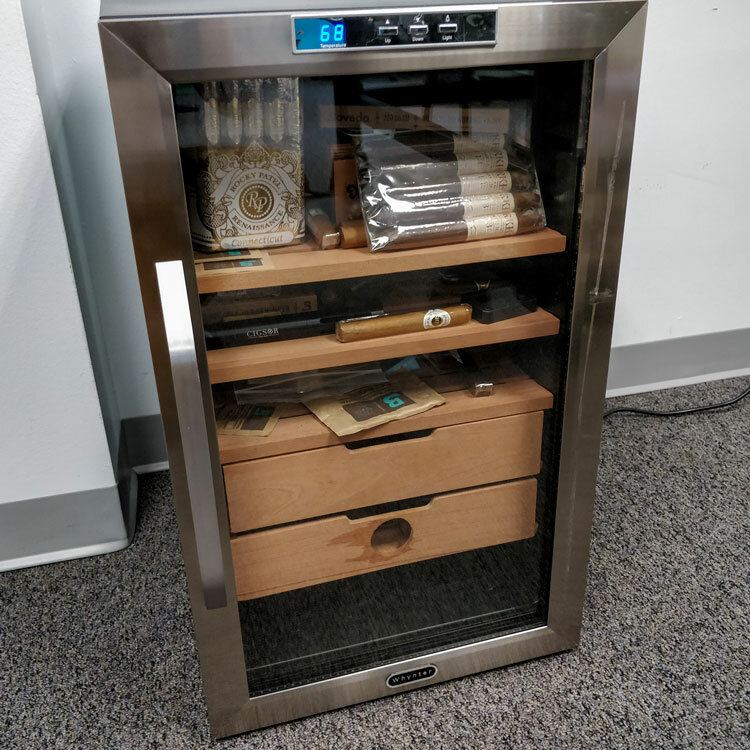 Not only are they able to provide enough humidity for a capacity or 150 cigars (or a cubic foot) but they also offer two-way humidity control. A typical pitfall that we all face is that we buy a humidor or cooler in the early stages of our collection. As such, we often underestimate just how many cigars we end up owning! This can be very frustrating as we investment in a storage solution but end up with far too little space. Consequently, we’re obliged to upgrade our cigar storage, which adds yet another cost. Try to plan ahead if you can and buy a humidor or cooler that’s larger than your intended collection. Although the initial cost is higher, it avoids spending more further down the line. Similarly, a larger cooler means that you’ll be able to space out your collection. Packing cigars too tightly doesn’t only risk damaging them but can also prevent the proper airflow. This risks facing potential pockets of humidity where it’s too high in some areas and too dry in others. With a temperature-controlled environment, this may actually cause more problems due to condensation too. While cigar coolers don’t need as much maintenance as a wooden humidor, you will need to follow some steps to fully prepare one. Although a cigar cooler isn’t made out of wood, it will need seasoning due to its shelving. Given that new wood is very dry, it poses a certain risk to your cigars. If you were to just throw in your cigars and a humidifier, you’ll notice that you’ll struggle to reach the correct humidity level. This is because the wood is absorbing all the moisture it can. And while it will be absorbing it from what’s released from the humidifier, it may even be sucking moisture from your cigars too! Therefore, it’s essential to season your cooler before you use it. Use our wooden humidor seasoning guide to do this. Although it’s a cooler, the approach is exactly the same. With sensitive electronic devices, you’ll always need to keep an eye on your cigar cooler. You never know when they may fail on you so it’s always important to periodically check the temperature and humidity levels. If you begin to experience any strange behaviour, you’ll be able to intervene. However, if you don’t check often enough, you may be too late by the time you reach for a smoke. The updated version of the CC-100, the CC-100H offers excellent value for money all-round. It’s capable of storing 250 cigars and features Spanish cedar shelving. However, we were dismayed by the analogue hygrometer. Be sure to buy a digital one for more accurate readings. Otherwise, this is an excellent purchase. Although it offers the same storage space than the NewAir 100H, the Whynter CHC122BD is slightly smaller. For collectors tight on space, this might be a huge benefit. We loved the LCD display and found that this was sometimes more accurate than the NewAir. However, we felt a bit let down by another analogue hygrometer. Although slightly more expensive than the other coolers listed above, the Clevelander proved to be the quietest when running. We were also very happy to see an in-built digital hygrometer, which was quite accurate when calibrated. A taller, thinner cigar cooler, the Elite Touch CHC-172BD is an impressive piece of kid. This was probably our favourite that we tested and a real improvement from the previous 172 pictured. However, in terms of pricing, it’s quite steep. Furthermore, we felt let down again by an analogue hygrometer, which is unfortunate given the price point. The Remington is a little different from the other coolers in this list. Instead of a wine-cooler style construction, this is a prestigious wooden cabinet with in-built humidity and temperature control. Indeed, it requires a much higher budget but you benefit from a fully built-in system capable of holding a whopping 2,000 cigars! The tempered glass front is fitted using a heavy duty seal to avoid any leakage too. A larger cigar cooler that’s capable of storing 400 stogies, the CC-300 takes more space than some of the others in the list (save for the Remington, of course). As such, it’s great for larger collections. Overall, we’ve had a positive experience with the larger cousin of the CC-100H. However, we have heard of some people who have struggled with this one. Therefore, your mileage may vary. Reviewed by Phil P., on 28th October . "Helped me make my decision. I wasn't sure whether I wanted a cooler or a classic wooden humidor. This guide helped me make my decision."